This mass-killing occurred in the town of Taldou (Tal-Daw), the southernmost portion of the cluster of villages known as Al-Houla (northwest of Homs). The massacre was carried out at various locations over the afternoon and evening of May 25, 2012. The most widely cited death toll is 108, including 49 children, 34 women, and 25 men. Most of these were killed inside their homes, after reported shelling of the city had killed others previously. By and large, the Syrian government has been blamed, with alleged witnesses and survivors describing an attack by their forces on families thought to be disloyal or too Sunni. The government and some witnesses counter that with a narrative in which anti-government terrorists attacked the town and killed various pro-government and/or non-Sunni families. Accounts from all sides tend to agree most of Al-Houla was rebel-controlled by May, but the strategic center and south of Taldou, its southern edge, remained secured by five active security posts. Accounts differ on when and how and if this last portion - where the massacres occurred - came into rebel possession. But as of May 26, the day after the massacre, rebel forces seemed in general control of Taldou, including its center, and the massacre sites. They had already controlled northern Taldou, with the mosque where the bodies were displayed, allowing them to control the news coverage and perhaps to coach the alleged witnesses they put forth. The following material on this page is only the most basic summary of each point, but serves to at least lay the relevant points out side-by-side. But the material at the pages linked is quite detailed in spots. For some further aspects not necessarily covered below, see the page Houla:Connecting The Dots. 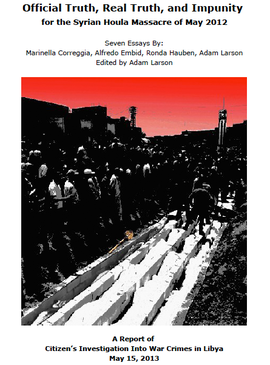 For a fairly comprehensive overview of Houla massacre revisionist studies, including a few of the most important highlights of our work here, see the May, 2013 report Official Truth, Real Truth, and Impunity for the Syrian Houla Massacre of May, 2012. Released by the Citizen's Investigation into War Crimes in Libya (run by wiki members), 79-page PDF available here, widely-read summary article at Global Research, and the 2014 report expanding on the video evidence for a victorious rebel assault dubbed the Battle of Taldou or the Battle for the Houla Massacre. The intensively illustrated page explores the city and its crime scenes in detail. Various maps and location-related sources are compared and distilled into best readings. There's a street-level visual tour up 'Main Street,' revealing telling details of what happened (it was violent and widespread). The overrun and/or abandoned security posts are examined in passing, along with the mosque and mass grave site, the various massacre sites, and some other places and things, like a dead goat. 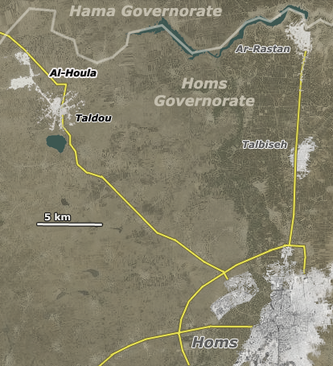 Below left: The towns of Al-Houla and their position relative to Homs and Ar-Rastan, both hotbeds of FSA activity. Below right: Taldou itself. The crime scenes are mostly on the southern edge. 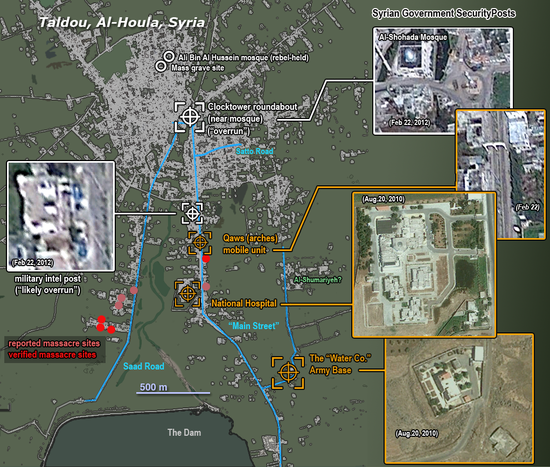 Main article: Houla, May 25: Who Was in Control? Another page uses that spatial understanding (see map below) and many of the visual clues to explore the very real possibility that the government's forces lost control of the city to rebel attackers on May 25, in the hours prior to the massacres. The work is still open, but has had amazing results, really, later condensed into this two-part article, and updated as essay 7 in the above-linked CIWCL report. The "digital witnesses" provide video evidence that the rebels won the battle of Taldou that came just before the massacre. Both pro- and anti-government sources agree that there were two main victim groups killed in two areas. Several subfamilies of an Abdul Razak (alt. Abdulrazaq, etc.) clan were the bulk of those killed, including the vast majority of the children. These were killed, mainly, in several homes clustered on south Saad Street. The other group consists of two families named Al-Sayed, living near each other on south Main Street, but not clearly related. Various tallies include likely rebel fighters killed in action, and list a few apparently unrelated civilians executed or killed by shelling. But the bulk of deaths coming from these few select families makes the question about their religious and political orientation central. While the narrative of a government/shabiha attack has no explanation to make them stand out from the rest of the town residents, the other narrative points to a pro-government stance of the Al-Sayeds, including a possible relation to a member of the newly elected parliament, and describes the Abdul Razaqks as non-Sunni Muslims (recent converts to Shi'ism). There has been confusion sewn by Rainer Hermann's FAZ report that an Alawite family was among those killed in Houla. Rather, it seems the name of an Alawite village was reported as a family name Shomaliya. It seems there's no such family known in the area, and likely no Alawites living in Taldou. But the massacre at al-Shumariyeh (10 victims reported) did reportedly occur on the same day - see the page Houla Victims: Shumariyeh/Shomaliya. It was, perhaps, planned in coordination for the same psychological effect Hermann's sources implied: rebels can strike Shia converts, Sunni supporters of the "Alawite regime," and Alawi, and manage to get the government blamed for two thirds of that, with the last one left un-reported in opposition tallies and generally ignored. Two sets of witnesses with two contradicting narratives exist, which indicates that one set or another of the two has to be grossly wrong and therefore, most likely, lying in some kind of conspiracy. Therefore we refer to all of them as "alleged" witnesses. The massacre was done by pro-Assad Alawite militias called Shabiha. 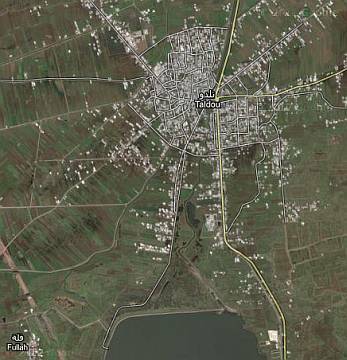 They approached Taldou from south-western direction coming from the small Alawite villages there. They had help from the Army which fired on peaceful demonstrators at a checkpoint and, extent widely varying in the testimonies, used heavy arms shelling the village. The victims were massacred because they were Sunni Muslims and/or protesting the government. They did it to spread fear and terror among people protesting the Government. This witness set comes mostly from western media sources. The number of alleged witnesses is higher than for the other, and most of them have names, but many were interviewed only by telephone or Skype and the contacts were made by opposition activists. There's one subset interviewed on the ground by Channel 4 reporter Alex Thomson who visited Taldou in the days after the attacks together with the UN observers, and one by SPIEGEL reporter Christoph Reuter who visited Taldou two months later on invitation of and "embedded" with opposition activists. The massacre was done by armed terrorist groups with help from local rebels. They approached Taldou from north-eastern direction coming from the city of Ar-Rastan which is controlled by foreign Salafists, and from villages on the way between. They attacked the checkpoints, took over the city and selectively massacred families loyal to the government and/or, varying on the testimonies, not Sunni Muslim. They did it to take control of the city, cleanse it and blame the government for their own atrocities to create international outrage. 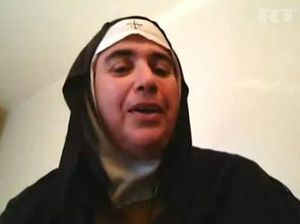 This witness set, mostly anonymous, consists of one central subset interviewed by a Russian reporter team in Taldou in the days after the attacks, an additional set of refugees interviewed at the monastery in Qara, and a couple of indirectly reported others. As a work in progress, this is an attempt to get more clarity by composing a triple timeline of events, comparing time-specific events as reported by alleged witnesses of both narratives, as well as those captured less ambiguously on video. The Syrian Government, the UN observer mission and the UN Human Rights Council each have put more or less effort into investigating the events. For different reasons none of them are satisfactory. A collection of some, often early, claims about the events which turned out to be mis- or disinformation. A rudimentary page of reported events before May 25, 2012, and especially after. 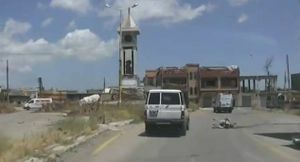 Videos dated September 12, 2012 show the southern outskirts of Taldou with the National Hospital as a ghost town. 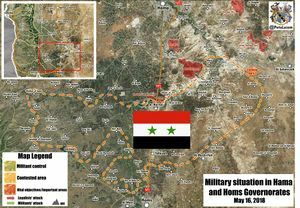 As of late September 2016, the area of Houla and east of it to Ar Rastan and Talbisah is the opposition stronghold of Homs province and remains under their control. Following a reconciliation agreement brokered by Russia, the government took back control and the groups handed over their heavy weapons in May 2018. As of July 2018, we know of no past-reconciliation ground reports from either side concerning the event. Alex Thomson told us in early June, just returned from another visit to Syria, that "you can’t get everywhere on limited visa access". Ordinarily, believing those presented as witnesses to the events is a fair course of action. But in this case, there are two distinct sets of witnesses with two overall versions. Within each set, the guilty party is agreed on, one set blaming government/Shabiha forces, the other rebel/terrorist attackers overrunning security points prior to killing the target families. So far the investigation at this wiki has leaned towards giving the "government" (or "non-rebel") version a fair chance at coming together. There is also an effort to get the best overall reading of the numerous witnesses supporting the version most of the world already believes. It might still be premature to announce just what happened in and around Taldou, but one fact at least is now clear; the anti-government version taken widely as fact must be questioned, and in place of that convenient certainty, a more thorough and neutral investigation must be carried out. This page was last edited on 21 July 2018, at 00:24.